I'm sorry for not writing here as often as I thought I would. It is currently 9:15am and its a beautiful gloomy Saturday here in Nashville. I fly home in two days, and I'm so excited to see my friends and family again. Since coming here I've made so many new friends and many of them have become like family, so it will be sad to be leaving them too. This journey has been one of the best experiences. 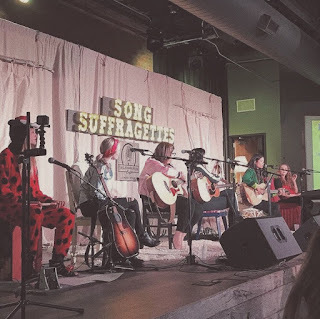 Last monday I played one of my favourite shows so far; Song Suffragettes at The Listening Room Cafe. My mom and I used to watch the shows when we were here four years ago and getting to play that same stage four years later with Candi Carpenter, Emma White, Trannie Stevens and Michelle Pereira was a dream come true. And it was an added bonus that we got to wear Halloween costumes on stage. I felt like I experienced so much 'american-ness' that evening alone, and it was awesome. 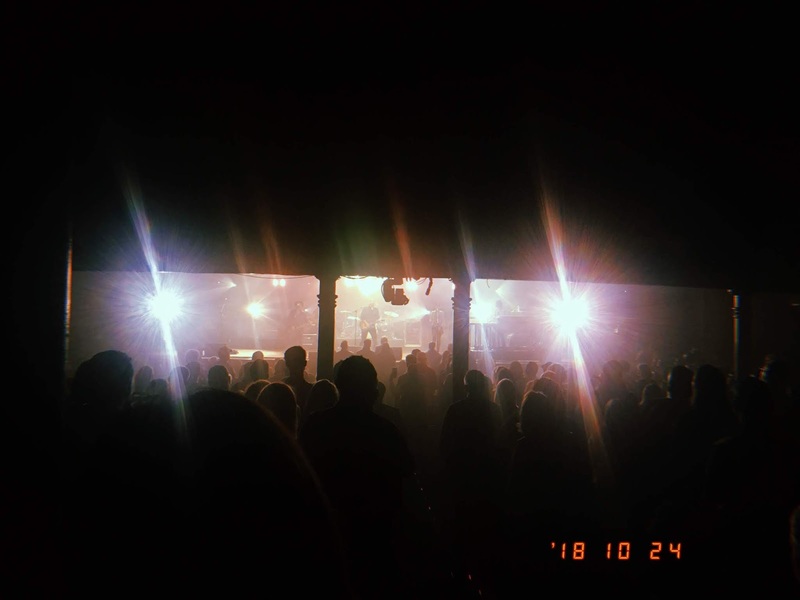 I got to meet so many people after the show and it was quite overwhelming. We got to talk to people and listen to their stories after they've listened to ours. I used to I write my songs in hopes that I'd get to play them at the cafe or restaurant while people talked over them and I'd be comfortable in the background, but this was the complete opposite- and maybe I need to reach for something more like moments like these. I also got to see my songwritng hero, Jason Isbell at The Ryman Auditorium. It's not the best picture, but it definitely was one of the best concerts I've been to. Did a lot of walking and hiking with a friend from the hostel the other day. We went to Radnor lake again this week and it was so beautiful. The leaves on the trees were turning red and shades of yellow and we looked at them in awe like a little kid would. We saw deer and birds and admired the little purple wildflowers. We watched the bees and the squirrels, and took many pictures. Breathing in the cool autumn air, I felt so grateful to be here and for everything that happened. I don't ever want to not get excited over the little things like these. Some days (kind of like today) I don't really feel like going out. Nashville doesn't rest, there's always something going on and always something to do, but I am not like Nashville. I can't go for every event and sometimes I regret not going out (like the time I almost went to a show at Bluebird but I forgot to buy tickets ahead of time and ED SHEERAN made a surprise appearance) but quiet days in are nice too. Lately I've been baking a lot and skating a lot too. I guess its because I know I'm going back to KL soon or maybe its just because I'm running out of socializing energy that staying in is so much more attractive to me. cereal for dinner whenever I wanted. Thank you for reading this, and for supporting me so far- even when I didn't believe in myself. See you again, Nashville. And see you soon, Malaysia.